Cult Beauty does four or five goody bags each year including an annual Best of the year set around the Holiday season; the Best of 2016 bag has to be their best one yet. See here for previous Cult Beauty Goody Bags of this year. 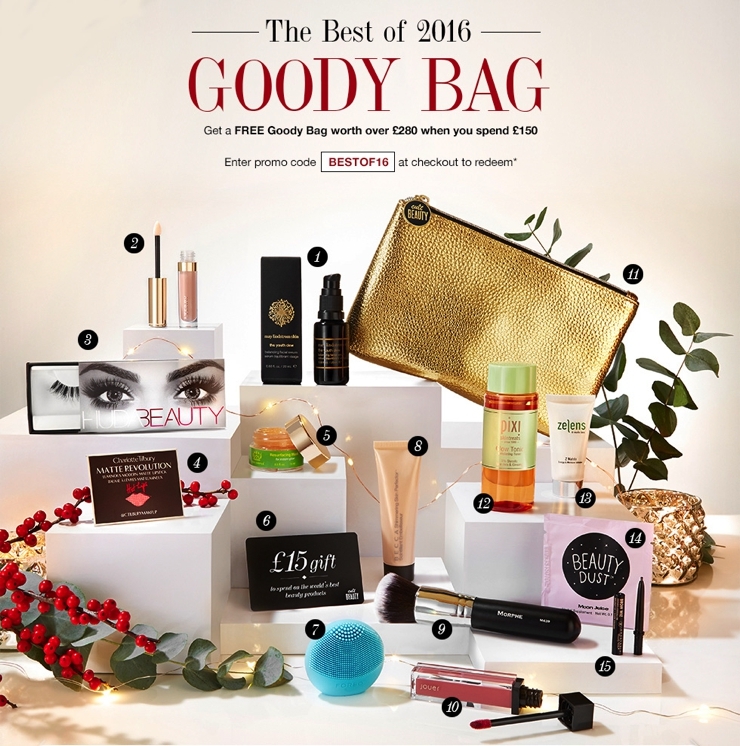 The Best of 2016 Goody Bag is worth more than £280 and contains 15 products, including six full sizes. The products are a selection of the bestsellers on Cult Beauty for the calendar year. These bags are always gone very quickly. Cult Beauty ships worldwide, and this is eligible for free delivery. Scroll down for the contents of the Cult Beauty Best of 2016 Goody Bag. Some BIG names in there. May Lindstrom, Charlotte Tilbury, By Terry, Tata Harper, Zelens. I love that the samples are all generous, and that there are so many full sizes in here. The May Lindstrom Youth Dew itself costs £96, while Foreo Luna Play is at £29, so this is a great deal. I also love that there is a nice mix of makeup, with eight products. To get your Cult Beauty Best of 2016 Goody Bag, spend £150 on Cult Beauty here and enter code BESTOF16 at checkout and the bag will be automatically added to your order. Includes free worldwide delivery - this is the PERFECT time for some Christmas shopping, and you get a free goody bag for yourself as well!